Bobby’s house is flapping in the wind. 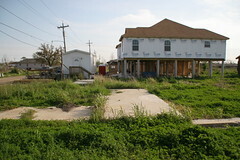 As one of the residents of New Orleans whose house was flooded by 3 breeches surrounding the Lower 9th Ward during Hurricane Katrina, she came back and paid 131,000 dollars for a house that’s a shell of completion. Her shell sits on 10 foot concrete stilts next to a house–abandoned long before Katrina–with trash on the roof marking where the water level was. 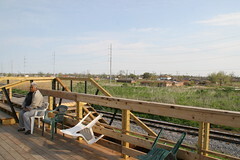 She and her husband live in one of the formaldehyde filled FEMA trailer propped up in front of their unfinished shell. They are waiting for the contractors to come back and finish the house, but even when they do come back and finish it, Bobby will have to pay at least another 30,000 dollars for siding, fixtures, flooring, etc; things that were not in the original contract. April 14th is the due date for the house, but it seems unlikely they’ll finish it so soon. Of course she’s one of the few who choose to return. The area around her looks more like a grass filled ghost town of empty foundation slabs, piled wreckage, an destroyed houses. She tell me there are three neighbors that she knows are returning, plus a habitat for humanity house, and possibly some others, but the vacant lots will likely remain vacant for some time to come. In one day Katrina created 65 years worth of garbage. Houses floated off their foundations and were thrown into other houses, on power lines (leaving people without power to this day), and left in the middle of the road. Bobby managed to recover some stuff from her attic such as photos that floated into the top of the house and sundries other tidbits, but she was lucky. She stayed with her daughter across the river and she lived. As I biked around the lower 9th ward, I felt as if I was in El Salvador, or India, or someplace where people decorate their landscape with plastic. It was surreal to ride down a street where the X mark of rescue workers was expected on every structure, almost as if it’s a barcode on a cereal box. It’s been nearly 2 years since Katrina and Anita happened, but the number of construction projects that are happening don’t make much of an impression. Kind of like a raisin in Raisin Bran cereal, present and tasted, but not the soggy theme of breakfast. Rally’s, the local burger shop, has rebuilt and is “open late now.” I ran into kids who had some Rally cheese fries and are out on spring break, out playing and enjoying the beautiful weather. They were the exception though, I didn’t see to many kids. Contractors were out and around, tourists like me in buses, vans, and cars were out and about, but I could go blocks without seeing living signs of human habitations in houses. I did see lots of military police, in hummers or police cruisers patrolling around Jackson Barracks. Protecting the new construction on the barracks in the middle of the 9th ward. Frankly I haven’t got a concept of the emotional tragedy that happened here. 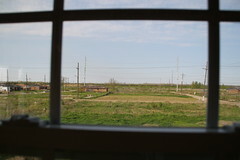 I’m only witness to a surreal spring day nearly 2 years after the fact, but it doesn’t fail to get the emotions running. Especially for a person who works across the street from the Senate Hart office building, my blood was boiling and my mind pondering. I’m glad I was on a bike, as the exercise helped keep me from blowing a gasket. Standing up on top of a levee looking at a forest of stumps left in the lake behind the Ward, I am ready to expose and annoy ignorant politicians as well as the people they represent, but I’m tired of ranting, so let me say this. 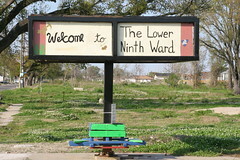 The Lower 9th Ward, Mississippi, and the rest of Katrina’s destruction, isn’t the only disaster we’ll see in the coming years, it’s only going to get worse. It’s to bad Louisiana doesn’t have the infrastructure for disaster recovery that California does, but I’m long done with believing that it’s unfair. Fair is only about things that people do something about. Bobby’s is doing something, she learned from the disaster. Her house will get built and this time she’ll probably come back to a house that is still standing next time. She’s built stilts that even another house sliding into probably won’t fell. We can do something too. We can register to vote and then vote. We can learn about the environmental, economic, and cultural reality we face, and start setting our own agenda for our representatives and candidates. We can stop watching television. We can stop reading our local papers, and pick up a paper that does real first hand reporting all over the world. We can start talking to your representatives & their staffers by email, by phone, and when they come home. We can volunteer in your community, and spend time working against the structural violence that exist in this country. 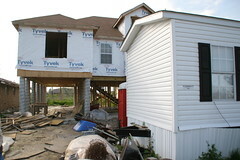 We can build the houses in New Orleans that the government are not going to build. We can learn to be and then act as engaged parents. We can stop being scared of the unknown, and learn about it. We can fly to someplace other then a resort for vacation and learn about the people who live there. We can be our own American ambassadors. We can stop working ourselves into a heart attack. We can start walking to work. We can stop start learning about what a real balanced diet is. We can start realizing that money doesn’t buy happiness, only attitude gets you there. We can do so much more then we are right now, but it’s going to require you and I to change. You and I have already started this process and we are taking back our government from fear. We are beginning to see the future our parents lived is not guaranteed for us. You and I are starting to understand that biological life is hearty, but human life is tender and very dependent. You and I are starting to make friends with the world one-by-one. You and I know War is Not the Answer, so let’s make levee’s not war. It’s time to build a strong base that we are sure will survive the natural disasters yet to come. Let’s see the real “New” Orleans when it’s finished.